Doesn't look so bad, does it? Yeah, well you haven't gotten close to it. 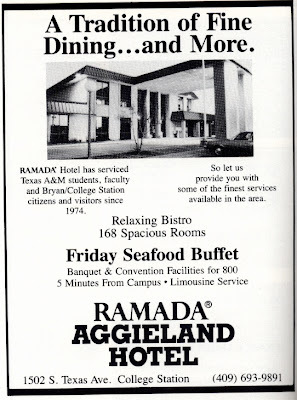 Opening in summer 1974 as the Aggieland Inn (named after a long-defunct hotel on campus, which had long been functionally replaced by the MSC and gone for many years), this hotel was initially successful with its restaurant ("Whistle Stop") but in the mid-1980s renamed to Aggieland Hotel shortly before being the Ramada Aggieland Inn by 1988 after Ramada pulled its name from the bankrupt tower. It renamed to Ramada Inn (like the former tower), then simply "Ramada". Even before losing the name, the Ramada had been going on a downhill trend for years, there's a story about how the restaurant accidentally(?) gave food poisoning to the Longhorn football team circa '99, and other minor stories of what happened there. 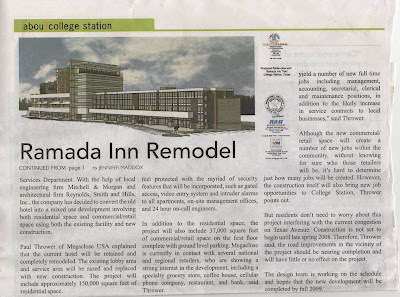 Sometime around 2006 or 2007, a new Ramada hotel began to be built on the bypass behind The Home Depot, and the name would be pulled. 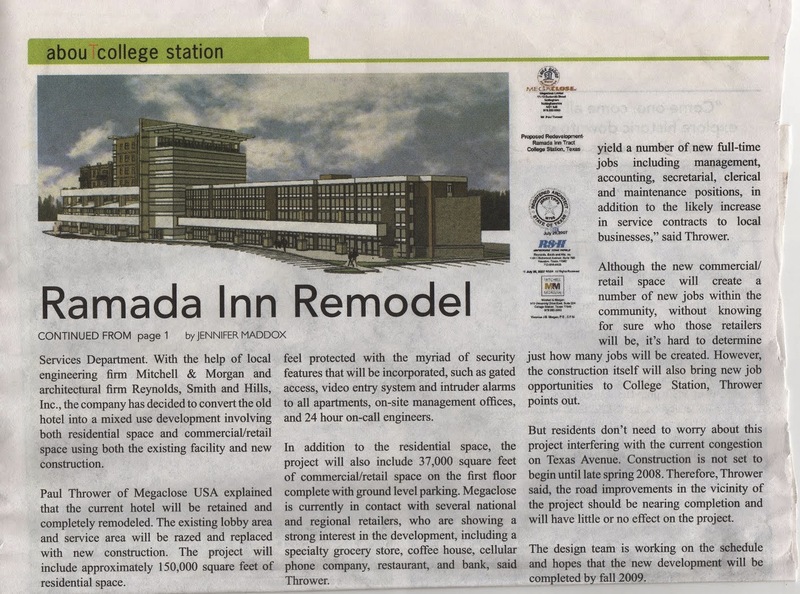 Since the economy was good at the time, an ambitious plan evolved to convert the Ramada Inn into an upscale student housing and retail complex. 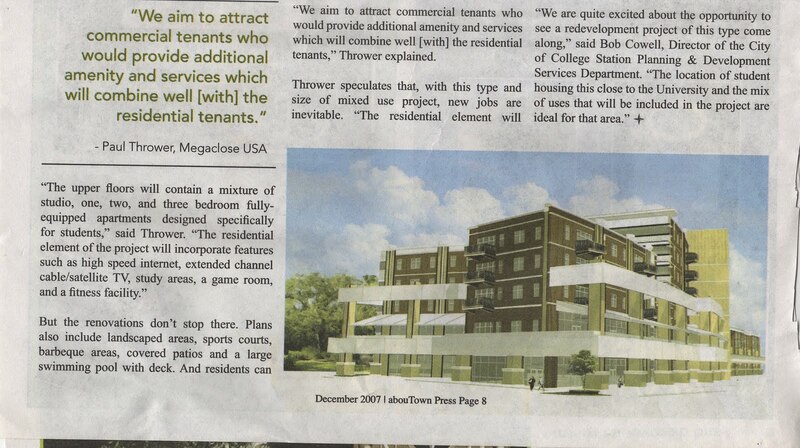 Here's some exclusive scans from the defunct AbouTown Press December 2007 issue. Obviously, this all never happened. Somewhere during this whole process (the widening of Texas Avenue was well underway at this time), the economy tanked and rather than a big redevelopment, the hotel renamed to "Aggieland Inn" (the original name), just like how the Clarion across the street became "College Station Inn". 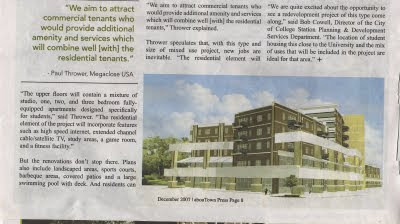 I loved how the website (at AggielandInn.com, but it's down) called itself a "2.0-star property" as if it was something to be proud of, which would've been like someone with a "Proud Parent of a C Student" unironically. 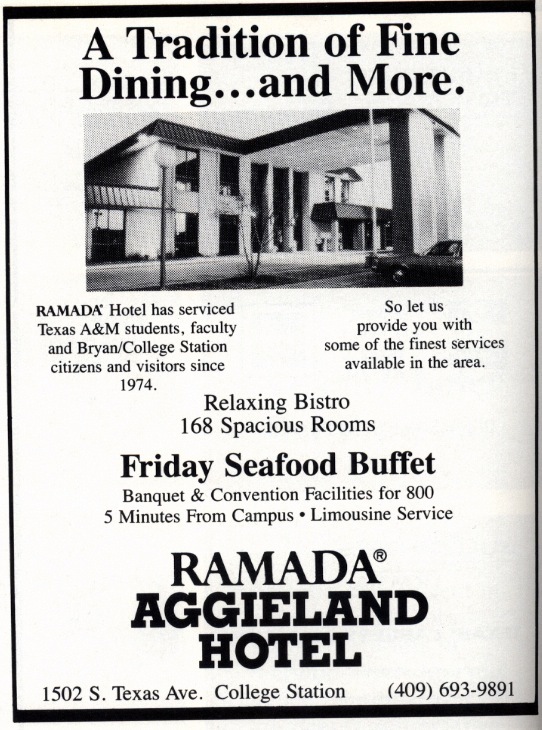 Unlike the 1970s incarnation, the "new" Aggieland Inn was a no-name junky hotel that received miserable reviews. The hotel shut down in for good in September 2011 just before the football season. In 2013, it got a repaint and was rumored to reopen for the fall, but it never did. 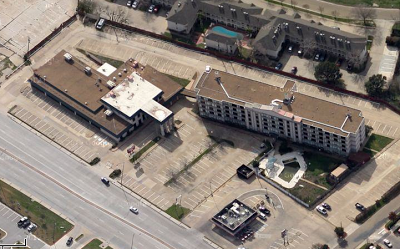 Here's a Google Maps 45° view of the hotel before the repaint. In addition to the new photo at the top of the page, in April 2015, I made a visit to snap some more pictures. However, there were lots of No Trespassing signs in the area, and I wasn't going to get arrested for some semi-defunct blog I was just updating, so here's one more shot of the hotel (I didn't get too close to the lobby part, unfortunately). Since 2015, much has changed. The pool out front was demolished for a new lobby and the peaked roof removed for the new incarnation of the hotel, TRYP by Wyndham. The hotel (with a new address of 1508 Texas Avenue S.) eventually opened in November 2017.